Take your basic salsa skills to an intermediate level with this improvers dance class, taught by Mina, the queen of salsa! With over twenty years' teaching and performing experience, Mina really is the Queen of Salsa! Incorporating an exciting mix of all the spicy salsa styles (Cali, Columbian, Puerto Rican and Cross Body) Mina combines her own, unique style with traditional standards to provide a sizzling salsa experience. Improvers classes are suitable for those who wish to move from a beginner to an intermediate level. Mina will help you to develop both your footwork and styling in an exciting, stimulating and fast-paced environment, allowing you to work at your own pace and continue improving your technical and performance skills. Classes are friendly and welcoming. No partner is needed as you will be rotated to gain dance experience with different people. Drinks and snacks are available throughout the evening to keep your energy levels up! As four of Mina's previous students have become UK and world amateur champions, you never know where her teaching might take you! Mina has dancing in her blood. She began her dancing career in Istanbul, Turkey, at the tender age of three. Starting with Turkish Folkloric dance and Belly dancing, she continued over the years with Modern dance, Rhythmic Gymnastics, Ballet and various Latin dances including Cha Cha Cha , Samba, Lambada, Mambo, Merengue, Cumbia, Boogaloo, Pachanga and, of course,SALSA. She has over 20 years teaching experience and, as far as she is aware, was one of the first people to start teaching Salsa in the UK, especially London, in the format that most of us are familiar with now and is probably the only teacher in the U.K. that is able to teach and choreograph an exciting and fun mix of all the Salsa styles (Cali, Colombian, Cuban, Puerto Rican & Cross Body) with her unique techniques. 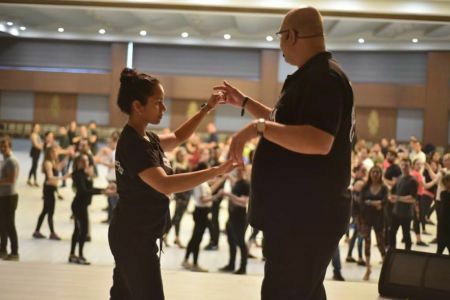 Mina always welcomes old, new and current students with a very friendly attitude, and wishes to continue dancing and teaching Salsa for many years to come.